If you are like me you travel with numerous chargers. You have one for the iPod, on for the phone, one for the camera, and then several car versions of the same chargers. Let’s forget traveling, my kitchen counter has at least three chargers on it at any given time. What if there was a product that could reduce all of the chargers you have to keep with you? The Chargepod aims to be that product and succeeds nicely. The Chargepod allows you to charge up to six different devices at one time. It is basically a very cool/modern looking disc that is the main system and you have adapters connecting to this disc for your various devices. The disc is about the size of a MacBook charging block, but thinner. You can have an adapter for your cell phone, your iPod, your device that charges via mini-USB, etc. The company says it charges over 3000 devices. 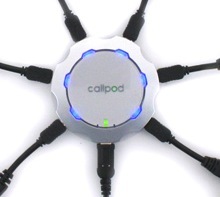 A list of compatible devices and adapters can be found here: http://www.callpod.com/adapters. Once you have all of your adapters, you only have to travel with the Chargepod and your adapters. 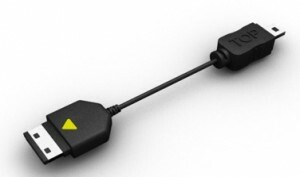 There is even a car adapter available to reduce the number of chargers you keep in your car. The Chargepod is great. I have been using it for several weeks now and love it. I charge my iPod, cell phone, and hands-free phone device off of it. It has allowed me to put away several chargers, and I wish I had this over the summer to travel with. The Chargepod package is not cheap. It is $49.99 and comes with the main unit and power supply, a carrying case, an iPod/iPhone/iPad adapter (yes it charges the iPad without the iPad saying “Not Charging”), a miniUSB adapter, and a micro-USB adapter. It also comes with a voucher for a free adapter. Adapters cost $9.95 and the car charger is $19.95 (plus shipping and tax). While not the cheapest product, it is very convenient and useful. The other great thing is when you buy a new device (i.e. Phone) you don’t have to buy new chargers, you can just spend $9.95 on a new adapter- especially when it comes to a car charger. If you have more than two chargers in use regularly, especially for traveling I highly recommend looking into the Chargepod. MyMac.com rating 9 out of 10.